Fun designs, ideas and inspiration for wedding flowers in Portland. I just meet a wonderful engaged couple who are both soccer coaches..it reminded me of the wedding I did for coach Jim of the Timbers and his bride Tammy. Actually there are many weddings I forgot to blog about , but I will start with this one since soccer is on my mind. The theme flower was to be the sunflower because of a Timbers senimential reason but Tammy wanted it to look classy and loved lilies herself. 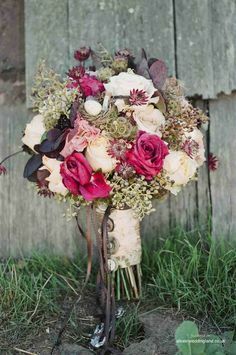 Here is her bouquet since I usually start with the bridal bouquet . The ceremony and reception were all in the same room above Kellys Irish Pub. So we kept the bright sunflowers in the entrance and on the cake areas. They used cupcakes too. and the nutural shades of pale yellow, creams and whites in the main rooom This is the backdrop Tammy and I created for her cermony with silver bowls of cream flowers, candles and framed pictures of their combined family. There where two cnadelabra on either side with pale and choclate sunflowers and cream flowers and a touch of crystal bling for Tammy. Didn't she make sunflowers into a classy wedding flower? Jim was awsome because he traded me the rental of the candelabras for front row seats to a timber game, my husband's idea, and Jim was a champ about it! Always love the first picture of Man and wife such joy on their faces. Tammy had me make a babies breath crown for her blond hair rather then wear a veil. She knew what she wanted. It was quick work to set up the head table and guest centerpieces right after the cermony but it worked and many guests took a break to watch the game down in the pub so everyone was happy and very hungry once the meal was served. Here are some other flowers used in this wedding. The centerpieces were on silver raised bowls and tables were chocolate brown with lace overlays I rented from Barclay. Don't you think Tammy's vision of converting sunflowers into a classy wedding turned out well? Happy New Year 2014! Have you seen the new Floral Trends by IFD for 2014? I have and it seems like the same basic styles from 2013 will continue. Take the one called Confetti, it is all the bright and bold look of last years Garden Club look but I find it's not as encompassing as the the bright color palette of the Garden Club floral trend of 2013. So I just combine both and call the whole thing "Urban Garden". With the continued trend of “urban gardens” especially here in Portland, you’ll see bright colors combined with birds/butterflies/garden tools. 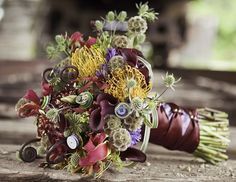 I have collected bouquets that are more this style, including some "Confetti" looking bouquets with added embleshments like buttons, bold parings of colors like turquoise and red, and lots of Ombrea blocking. An overall fun and young style for sure. 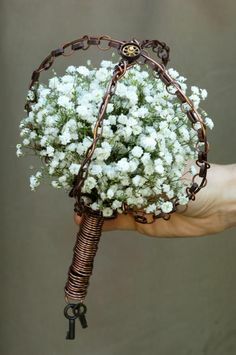 Take a look at some of the pins I have collected at http://www.pinterest.com/portlandflowers/urban-garden-bouquets/ to see more. 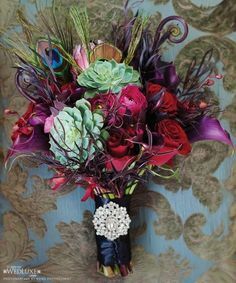 Nothing tame and girly, everything in her bouquet had to look like it was alive and maybe locally gathered from her under the sea, garden home. I used golden ginger beehive, shell calla lilies, sea grass, sea green fern frods and more. Her veil is fish netting decorated in sea grass and an assortment of sea colored greens chosen for contrasting texture. We did not want it to cover her purple gills though, as we think she should be proud of the mythical ethnicity. Head veil and modeling by Abby, bouquet by Laurie. Its sort of annual summer tradition, every year when Abby comes to visit Portland we save one day for a bridal design and shoot. We were super inspired this year to make it happen and as usual we got to the end of the week and had one day to buy, create and shoot our ideas. What do you think, did we pull it off? Any ideas for next summer? 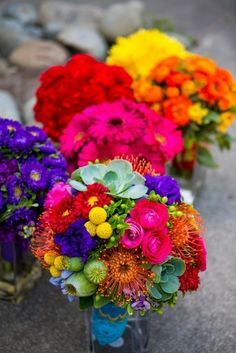 "Flowers always make people better, happier, and more helpful. They are sunshine, food and medicine to the soul." I know that beauty heals the soul. Any beauty, a glorious sunset, painting, music or dance, a perfect moment in time when the world is as it should be. Beauty is a taste of the eternal, the longing for heaven. Flowers, are a gift of beauty from God to us and a way to show love to someone when words are not enough. They are food and medicine to the soul. I can testify from my own life when I was overcome with PTSD, it was beauty, only beauty, that could minister to my soul. I was in a dark period when nothing in life made sense, and I could not find words to convey my emotions. I was angry at God, people and myself. The comfort God gave me, the one place I felt His love, was when I took a walk and admired the South African gardens. Bird of Paradise, Calla lilies, huge ferns, fiddleheads and other exotic beauties grew. How could I resist arranging the colorful mixes of His creation. A sense that God was larger then my situation, that God had a divine order and plan was was somehow conveyed in his creation. Erik Little said in his book “Chariots of Fire”; "when I run I feel His pleasure". I also "feel His pleasure" when I design. Every arrangement is a whispered prayer and it is not just for me anymore. I help one human send the gift of beauty to another. Flowers are sent to welcome the first day of a new babies life, her first Prom and maybe her first crush. All the hope and joy of the most important day of her life, her wedding day. For every special occasion and anniversary in-between, to the overwhelming sad days on the death of loved ones, it's flowers we want to send. I have the honor of being the messenger, and interpreting the strongest of human emotions in the art form and gift of well arranged flowers. Corrie Ten Boom was raised in Holland were fresh flowers in the home was a natural part of daily life. After the Holocaust she noticed how flower gardens seemed to heal victims of the Holocaust best. She observed that the day a survivor wanted to deliver something from the garden to an ex-Nazi soldier, was the day they forgave and could begin to re-enter society. 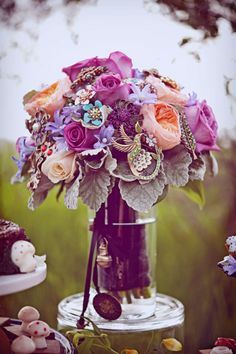 I hope I have conveyed how powerful sending flowers can be for the sender and the reciprocate and why this designer is so passionate about it. The day after Mothers Day, on the heals of Prom ..it's a day to wonder if my cut fingers, sore body and sleepless week was worth it? Yes, I live for those smiles more than a paycheck. It's that human element to business that makes it meaningful to me, part of using my design skills is to share them and minister beauty to those who need it. Here is my most recent bouquet called "Walk in the Woods". I had fun with the birch wrap, mossy sticks, and the challenge of a natural hand-tied cascade bouquet. 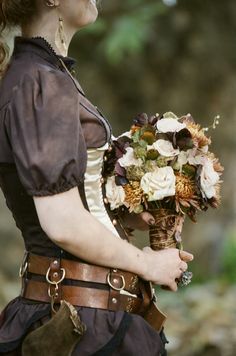 For inspiration, I have been insanely pinning, drinking in all the newst, incredibly creative bridal bouquets like an acoholic. (not best illustration since I have never been one). But I know my soul needs beauty and immersing myself in all the exciting new trends this year ignites my passion for designs. 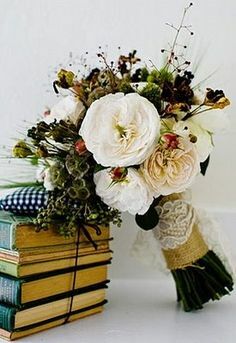 I am loving the main emphasize on textural bouquets and I get it that all the trends have a nostalgic, blast from the past feel. Seems like fashion reflects what people want and we collectively long for a simpler time. A time when we understood the world and actually had daily conversations face to face. Times are a changing fast and one generation can not hope to caught up to the next emerging one, but we long to connect. I can remember pre-computer days while my baby grandsons already use their i-pads before they can speak a sentence. I collected pins to suit the New Victorian board originally for somebody elses booth in the Portland Bridal Show this year. Then I just kept going making boards for every trend and seeing the patterns, the connections. I had been helping many shops design their weddings, their blogs, social networking, updating their webs and even helped one build their web with my design set. And why? The hard answer was to keep a steady income and maybe get ahead. The cost was neglecting my own gifts and my own business, and not using the gifting God gave me. So I resigned everything, today actually, and will focus the rest of this year on launching my business back up. Flowers by Design is back and I will be booking weddings! Life is just too short to not do what you love and be who you are, talkin to myself again. Anyway, check out my Pintrest finds and see if you don't love the nostolgia in the 2013 trends. I give them credit for inspiring me to go for my dreams again. Enjoy and be inspired! I couldn't be more pleased with how well it turned out working with my own daughter who visits every summer. The model and artist is Abby Kern. I just helped her idea happen like I do with every bride. I designed the bouquet out of all local Portland grown herbs and greens. You could eat the bouquet or dry it and use it for seasoning for the next year. Talk about spicing up you wedding and marriage! 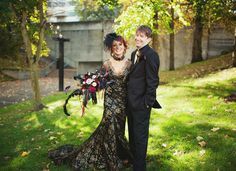 Abby designed her headpiece, don't you love the textures and wild curly garlic..there is so much to love about all of it. Abby style with the dress, boots and tattoo and her choice of locations in Oregon City's old forest . 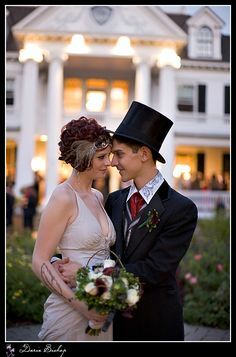 What do you like and would you wear a headpiece like this for your wedding? Isn't she having a blast! Gorgous bride and an artist. A wedding I helped design last June was featured in the" Inside Weddings" magizine. Wow, it feels really good! Nearly forgotten all the work and fun of pink Peonies, tables of carnation topiarys, a 10 foot pink carnation curtain, and endless shades of pink rose petals..
New Bouquet and Big Hair? Guess who came to visit Portland and help us out designing flowers for the shop? Miss Abigail BIG HAIR. Can you tell her hair has to be the biggest hair in Portland. She has a great eye and we must design a flower wig together one day! I had my moment of glory when one of my favorite mentors stopped by our Portland Bridal show booth. Leanne Keslenger of Floral design institute. I could hardly talk but knew enough to show her my masterpiece bouquet...Tangerine Tango bouquet to show off the 2011 Patone color of the year. No one at work knew or cared, as I ofter "nerd out" on some new floral trend. But Leanne got it, its her passion. I also designed the before and after centerpieces for the same wedding. For the welcome dinner the bride choose Rachel Ray Jello vases in green. The groom liked the price. Not many guys like to spend on the flowers. But I think this one brought a smile.. The farewell brunch was a great time and the client was very pleased, She requested a Hosta plant so the local guests could plant them afterwards, but left the design up to me, yeah! I love making Tablescapes and added a little bouquet of tulips on the table for a nice farewell touch. Varigated hosta, Bear gress, curly willow and spider mums, lots of fresh oregon moss, fressia and french tulips. I did all the wedding party flowers but just one picture..men wore these pink roses with peony buds and women wore gardenias. Pink Peony balls in silver bowls for the sweetheart table. Not a lot of creative wiggle room but did slip pearls in under the peonies, wonder if she noticed? Gardenias in the out houses and a garland on the carriage and the wedding day part is done. Just found these pictures from last summer, I'd never published. Guess I was waiting for the professional ones..story of my floral life, None-the-less, here's a little wedding done at a vineyard on a farm. On Location set-up for ceremony. You can see the grape vines as the backdrop. For the reception tables she used candles and more pink on pink rose petals. Pictures from the new Mrs Wise! Cake topper and toss bouquet. Lime green button poms and hanging amarathus makes the red "pop" and keeps a red rose theme fun and young! how the bride wanted them with orange and red flowers, she was all smiles. The "Do it Yourself Bride" is a growing trend in today's economy. 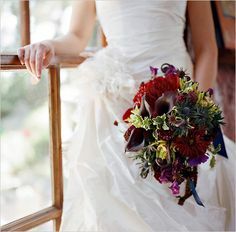 I have had several brides who only needed a bridal bouquet and the pin-on flowers from a real florist. The rest, they did themselves or had family pitch in. It's always an honor to help no matter how small! And a whiteish Vintage bouquet for Mickey she just picked up last night for her wedding today. She was actually my winner of the free Bridal Bouquet for the Bridal Expo. When I called her, have to admit, I was hoping she would need more flowers from me..but she was a DIY Bride. All of my DIY brides have said AFTER their wedding they would not recommed doing it all yourself (DIY) to other Brides..too many last min. details, and a lot of pressure and work. I agree! Let me help you out and at least do the wedding party flowers so you can be a cool, calm bride and take lots of bubble baths so your smile for those pictures is a real smile of peaceful bliss! Here are some of our most popular rental items. As you can see renting is a lot more affordable as most of the money can be usedfor the flowers not vases you don't want ! Just call for prices,, as it is less the larger the wedding package deal is. White muslim Chuppa ($300 total) and or Candelabra's which also come with 9 Candelabra candles if you need them rents for $50. We aslo rent most vases for a fration of the cost. see "rental" page on this web.